Follow me as I take my sweet tooth into my own hands… my baking hands! Preheat oven to 350° F. Place parchment paper on two cookie sheets. Beat eggs, stevia and vanilla extract with electric mixer. Add butter and blend well until smooth and creamy. Sift flour, baking powder and salt, then add half to egg mixture. Mix well. Add the balance of the dry ingredients and mix thoroughly. Dough will be thick. Process dried cherries in food processor until in large bits. Fold chips and cherries into dough mixture. Shape into 1 ¼ ” balls and press down with hand until about 2″ flat onto baking sheets. Bake for 10 to 12 minutes or until bottom of cookie becomes slightly browned. Cool on wire racks. 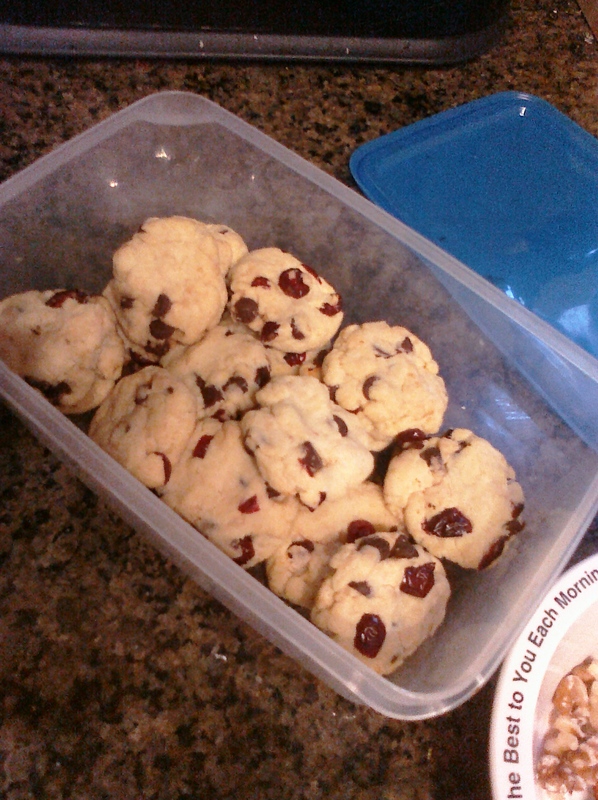 **I replaced the white chocolate chips with dark chocolate, and the cherries with dried cranberries. These cookies were not like your traditional cookies! They were soft and crumbly, with a scone-like texture. Nor did they taste overly sweet, but had a nice hint of sweetness to it. less than 1g 12g- 20% more! 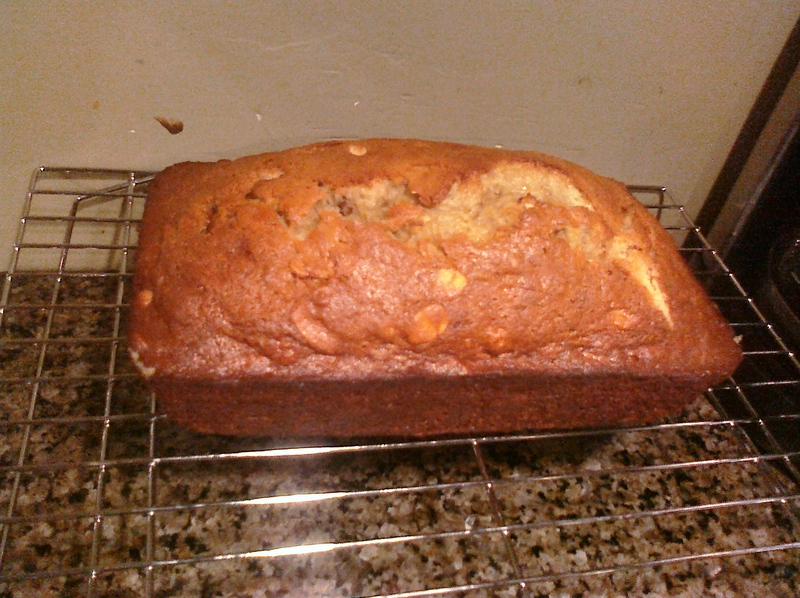 I know this isn’t my usual choice of food to satisfy my sweet tooth, but I make a mean banana bread. My mom passed on her recipe to me and I’ve used it ever since! Especially as summer turns into fall, I love to fill the house with the smell of homemade baking. Heat oven to 350. Beat together sugar, oil, egg, and lemon rind. Sift together flour, soda and salt. Add to banana mixture and stir to combine. Fold in nuts. Pour into well-greased 9 X 5 X 3 inch loaf pan. Bake for 50 – 60 minutes or until done. Remove from pan and cool on rack. Makes 1 loaf. I usually omit the lemon rind. Also, I like to add a bit more banana. I’ll mash-up about three large bananas, instead of two. Most of the time, I don’t add the optional nuts. I have tried walnuts and almonds. Another thing I have noticed is to be careful with how long it’s kept in the oven. Every oven is different, however, I find no need to keep it in longer than 50 mins. You be the judge, but just keep a careful eye. All I need now is a delicious cup of coffee! Enjoy! Thanksgiving is a holiday that is surrounded by food. Everything from breakfast to the leftovers, thousands of people are spending quality time in the kitchen. This year, I’m cooking my very first Thanksgiving meal. But, before we can feast on turkey and all the fixings, breakfast must be served. 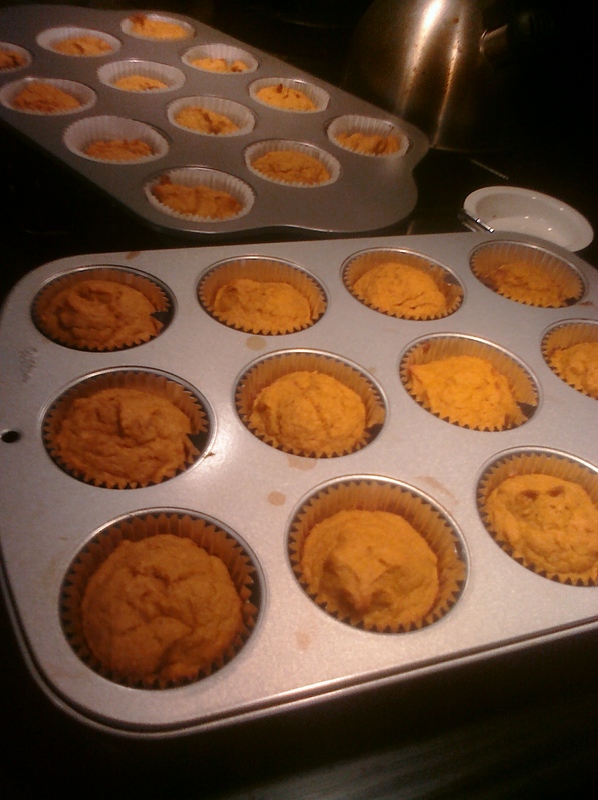 I choose to bake Pumpkin-Gingerbread Cupcakes. Preheat oven to 350°F. Line a miniature muffin pan with mini cupcake liners or spray and flour the pan using canola or olive oil cooking spray. Set aside. In a large mixing bowl, stir together flours, baking powder, ginger, cinnamon, nutmeg, salt and sugar. In a separate medium bowl, whisk together oil, eggs, vanilla and pumpkin, then add to flour mixture and stir to combine. Spoon batter into prepared pan and bake for 15 minutes, or until done when tested with a toothpick. Allow cupcakes to cool in the pan for 15 minutes, then continue to cool on wire racks. I opted to make regular size cupcakes (I didn’t have a mini cupcake pan). The cupcakes did turn out more muffin-like. They weren’t overly sweet, and had that grainy texture. I also choose to not top it with frosting, since these were for breakfast. They suggest using a Maple Cream Cheese frosting, and I would too if I were making these for dessert. Overall, these were a great breakfast treat that the whole family would enjoy. Plus, they were so easy to make, so it left plenty of time to get to the more important things… like the turkey, or pumpkin pie! 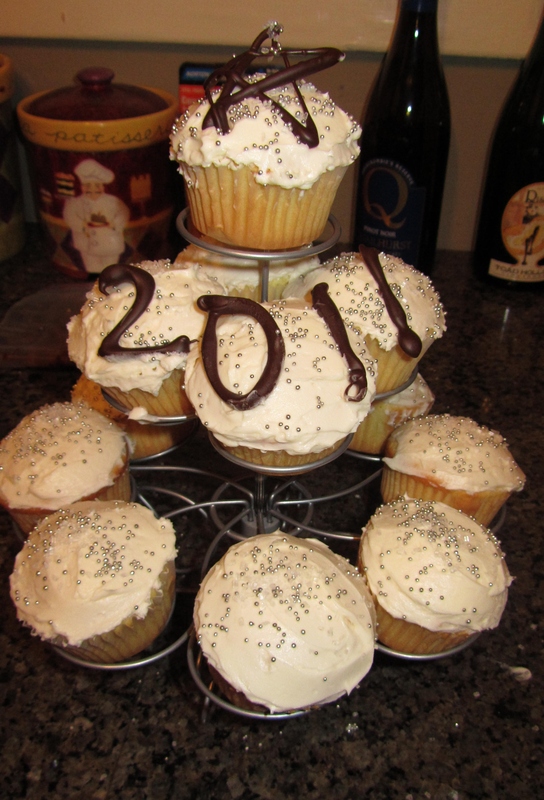 To ring in the New Year, I decided I needed to add a little sweetness by making my own cupcakes! With all the cupcake recipes out there, it was hard to choose which one to use. After reading several cookbooks and online recipes, I finally choose which one to make. I opted for the basic vanilla cake recipe out of Hello, Cupcake! and a wedding cupcake buttercream recipe from RecipeGirl.com. 1. In a large bowl, with a hand mixer, cream together sugar and butter on low speed. Mix until well blended. Increase speed to medium and beat for another 3 minutes. To add a little sparkle, I added edible silver balls and white sugar crystals (I know, I don’t particularly like sugar crystals, but I was limited to my decorating supplies). Then, I made chocolate 2011’s for the finishing touch. The frosting turned out fantastically and I heard great reviews on the cake from my friends. However, I personally didn’t sample a cupcake until the next day. I had left them out on the counter overnight, which dried out the cake. I was so disappointed in myself, but learned a very valuable lesson! 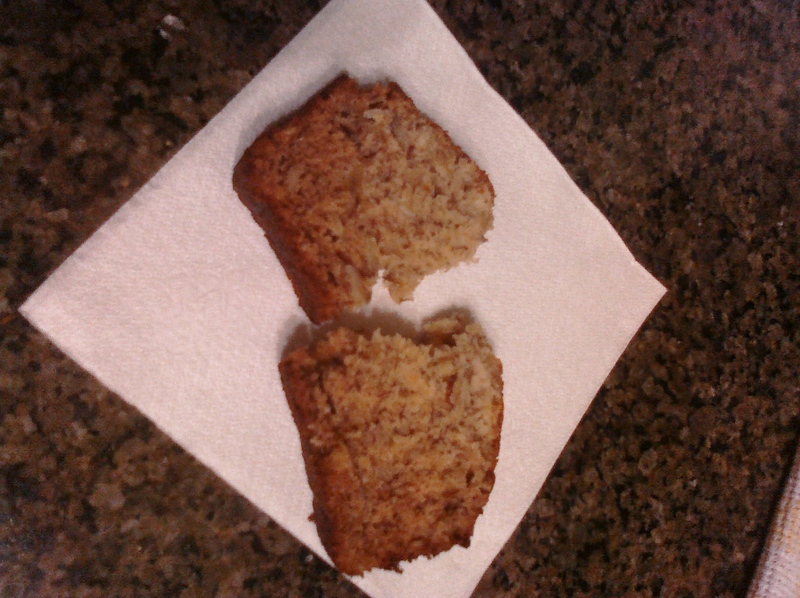 I can testify that that banana bread was delicious! And I totally do not like nuts in my b-bread. You’ve made me a believer. I will have to send you my family’s banana bread recipe. I die. You can try it out!! Yes, please do send me your family’s recipe! I would love to try baking it! Great recipe, I like to add chocolate chips sometimes to my banana bread too, great for a decadent breakfast treat! What a great idea! I’ll have to try that next time!